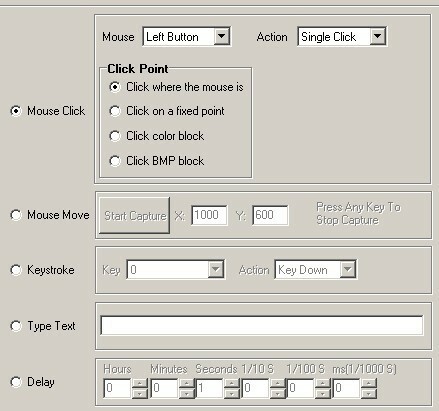 Ghost Mouse Auto Clicker is a Windows Script Macro Recording Software used to auto record mouse movements, mouse clicks, keystroke actions and repeat them at any time and as many times as you want.It also can auto type text what you type the same again and again. And it can be used to click at specific color or a picture on the screen. How To Record Mouse And Keyboard Actions? How To Modify Recoded Actions? How To Relpay Mouse And Keyboard Actions? How to delete the last click action? Step 1, click here to set up record options. Step 2, here to set up record mouse move and keystroke or not. Step 3, here to set up record hotkey.By default, ' ALT +F2 ' to start record and ' ALT + F3 ' to stop record. Step 4, here to start record actions. Step 5, here to stop record actions. or, click here to create a new action. Step 2, here to modify action styles and details. Step 1, click here to set up replay options. Here to set up replay hotkey.By default, ' CTRL +F2 ' to start replay and ' CTRL + F3 ' to stop replay. Here to set up repeat options. Here to set up repeat interval . Here to set up repeat speed . Step 2, here to start replay actions. Step 3, here to stop replay actions. Here to load action files saved before. Here to save actions to a file. This tool can recode every action after you start to recode, even the last click you mean to stop. If you start and stop the recoding by click button, not by press hotkey, you should delete the last "Stop Click". Step 1, move to the bottom of the recode list by click the right scrollbar. 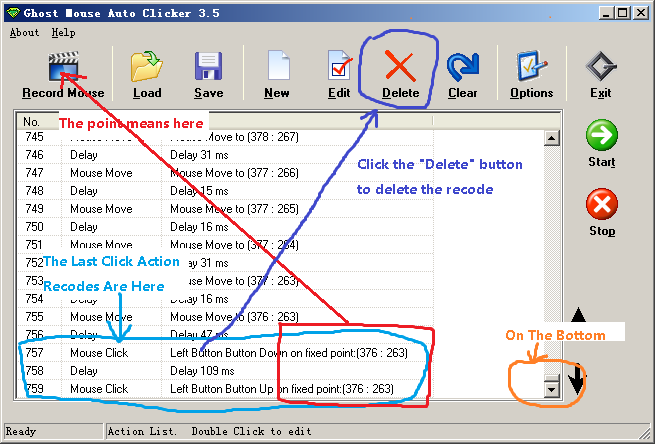 Step 2, click the last "Left Button Down" and "Left Button UP" recode , then click the "Delete" button to delete them. Recommend to use hothey to start and stop recoding, you will no bother with this. By default, the start hotkey is "Alt+F2" and the stop recode hotkey is "Alt+F3".